The first grouping of data comprises the data used to construct the above map. 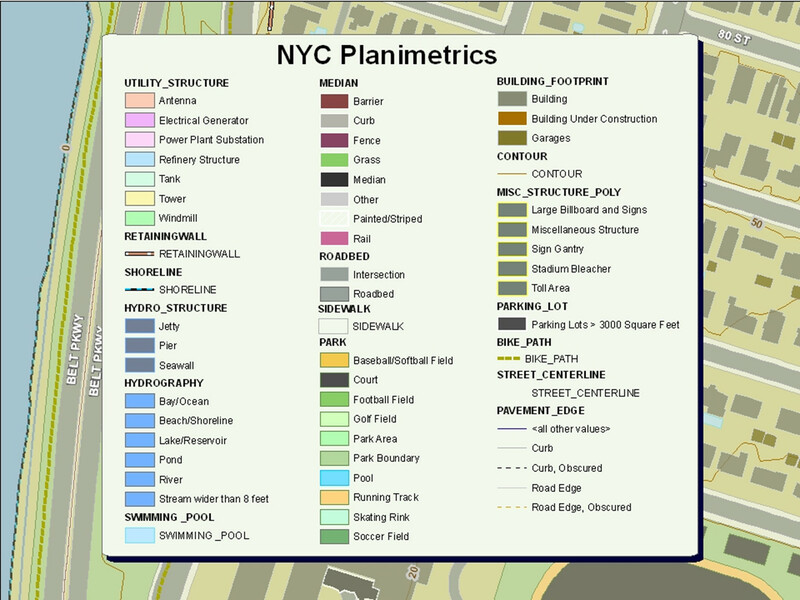 These data are referred to as the planimetrics (aka NYCMap). Planimetrics are features captured from aerial photography and represent the City’s basemap. These features are updated on a four year cycle. Most but not all features are provided to the public. Utility structures is one that is not due to security concerns. For an historical perspective and to see how far we have come, read the following article on NYCMap. *Note the full article requires a subscription. The second group represents other NYC DoITT data that may be of interest but is not necessary for producing a basemap. Some of these data are maintained directly by DoITT and others are compiled from agency sources. We do our best to keep these data current. The last group includes notable geospatial data sets not managed by DoITT and agency sites where spatial data can be found. Every effort will be made to ensure the above table is complete and the links are current. If you find an error or omission, please feel free to add a comment below to let us know. Lastly, check back periodically as this table will be expanded as newer data sets are published.